With the way the New Jersey Devils performed in 2016-17, it is difficult to look back fondly on the season and identify any stars in the making. Despite the team’s 28th ranked 70 points, there was some good to come out of 2016-17. Here are the three Devils who won fans’ hearts at a time when the team’s performance was entirely flat. For all the flack he gets for playing like a checking line center while being paid like a top contributor, Zajac has revitalized his career the last two years. After a disastrous 2014-15 campaign that saw the Winnipeg-born center collect only 25 points in 74 games, Zajac has scored 42 and 45 points in 2015-16 and 2016-17, respectively. One of the Devils’ longest tenured forwards’ greatest strengths is his ability to find chemistry with his linemates over the course of the season. Over the last few years, Zajac has found his footing alongside some talented and not-so-talented linemates. In 2013-14, it was Jaromir Jagr and Dainius Zubrus. In 2015-16, it was Reid Boucher and Kyle Palmieri. 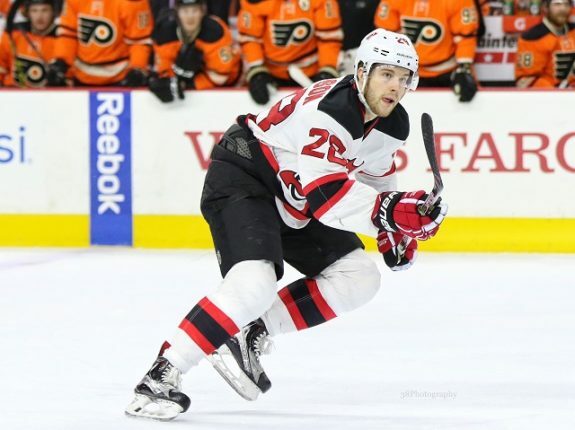 This season, Palmieri and Taylor Hall helped propel Zajac’s play to an impressive level. His ability to mesh well with big forwards like Zubrus and Jagr but also skillful and shiftier ones like Palmieri and Hall lends to Zajac’s team first mentality and versatility. No talk of Zajac would be complete without mentioning his off-puck and defensive play. Of the Devils’ full-time forwards, Zajac finished fourth in Corsi while still starting the majority of his shifts from the backend. Only one Devils forward – Stefan Noesen – is more successful in driving play while being held back by unfavorable zone starts. Zajac also fared well in the faceoff dot with an efficiency of 54.6 percent, good for 20th in the NHL (min. 700 faceoffs). The next best Devil in that department was Vern Fiddler, who, at 52.6 percent was signed in large part for his faceoff and defensive reliability. It’s true — on most teams, Zajac would be a second or perhaps third line center. However, he has carved out a niche for himself on the Devils and, with the salary cap continuing to rise and the future addition of a top line center via the first overall pick in the NHL Draft will continue to fall in line with his appropriate pay-grade and role. That’s quite a bounceback for a player once named one of the most overpaid in hockey. Another Devils draftee making waves, Severson had his best season in 2016-17 and is still just 22 years old. His point totals have increased over each of the last three seasons from 17 to 21 to 31 while his time on ice has gone from as high as 21:58 to 20:21. Playing on the second pair, Severson had much more scoring potential this season as he took the ice against less talented competition. Severson had a white-hot start to the season before cooling down significantly. Perhaps his biggest area of growth when looking at his scoring ability is consistency. When the Devils went cold, Severson was nowhere to be found and proved unable to lift the team out of a funk. As the team fared worse and worse, Severson’s plus/minus rating went plummeting and he was on the wrong end of several opposing goals. A typical top-pairing puck mover has the creativity and awareness to make plays, even when most of the team has run cold. On the defensive side, Severson was untested in 2016-17. As a rookie, Severson played on the top pairing and held his own in the defensive zone. This season, John Hynes utilized him essentially as a quarterback on offense while giving him little responsibility on defense. The resulting numbers look nice for Severson, but the reality is that he was not asked to do much. A 50.0 percent Corsi for appears good on a team that was consistently barraged with shots, but it looks less appealing when considering that Severson was put in a position where his Corsi should have been significantly higher than his teammates. Loaded with potential but plagued by inconsistency, Severson could cap out as an adequate second pairing defender or could become a focal point of the Devils’ defense for years to come. The 2016-17 season was certainly a step in the right direction, but it will be up to Severson to keep up his scoring when he eventually starts playing more in the defensive zone. In a year where no Devils player shined bright, it was ultimately one of the team’s success stories of 2015-16 that proved most valuable this past season. Kyle Palmieri has taken his play to new heights since arriving in Newark in June 2015. After a career high of 31 points, Palmieri came back home to New Jersey and had his best season in 2016, with 30 goals and 57 points. After a season like that, it is natural to see a dip in production, but Palmieri picked up right where he left off. In two fewer games, Palmieri scored 26 goals and 53 points. Unlike many of the league’s top right wing scorers, Palmieri does not live and die by his ability to light the lamp. He is more than capable in the defensive zone, is an adequate forechecker, and even kills penalties. Palmieri is not a defensive stalwart, but there is no concern about leaving him on the ice to hold a late lead. A complete winger like Palmieri sets the tone for a right side that was once in disarray. By all measures, Palmieri is a first line right winger and potentially an above average one at that. On a league-wide level, he is someone to account for at all times. On a team level, he is the Devils’ most valuable player.